Brian was able to get off of work early that Friday. So around noon we were off to one of the coolest locations in all of Arkansas. We were hiking to the Goat Trail that evening. 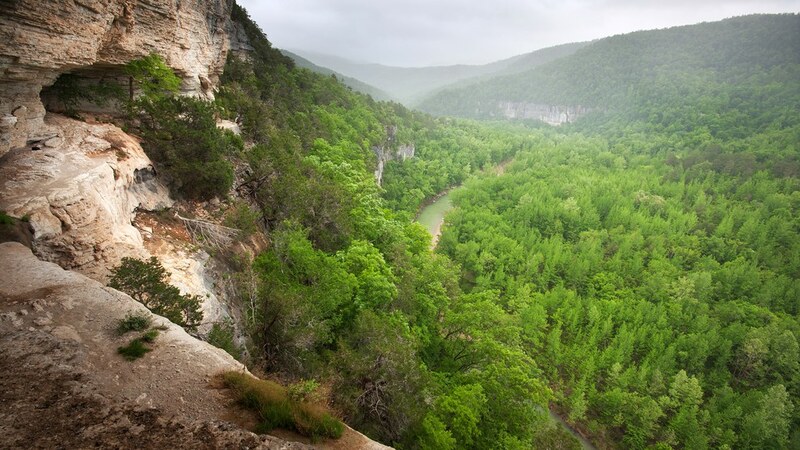 A location which is precariously located on the side of the tallest bluff between the Appalachians and the Rockies: Big Bluff. We arrived at the trailhead and started our 3 mile hike in what seemed like winter conditions. The temperature was approximately 48 degrees with blowing cold wind and mist. I’m glad I had the foresight this trip to pack some heavier clothes; a hoody was definitely helpful at blocking the wind and keeping me warm! If you’ve never been to the Goat Trail on Big Bluff then you’re missing out! The hike in is 3 miles, but gradually downhill and easy. I think we made the hike in a little over an hour. That was with about 50+lbs on our backs, so if you’re day hiking it, you could probably do much better. We weren’t in a hurry so we hiked at a steady pace. There were around 5 vehicles at the trailhead on the way down, but we only saw 4 other people on the trail. Two separate groups, a younger couple and a mother and daughter, were on their way out as we were hiking in. The mother and daughter actually hiked all the way to the top of the hill before the drop to the Goat Trail and then turned around without even seeing the view! Brian and I were kind of shocked when they said they walked 2 miles then turned around. We couldn’t fathom why someone would want to hike the trail to the top and then not even see one of the best views in the state. Oh well, to each his own! After arriving we quickly set our gear aside and took the cameras down to the Goat Trail for some awesome pictures from Big Bluff. The views were amazing, as can be expected, and there was good cloud cover on the tops of the mountains. We explored the bluff for about 2 hours and got some great shots of the scenery. Shortly after we arrived a couple of canoes came around a bend in the river. Brian and I saw the perfect opportunity to grab a couple of shots that would show the scale of this magnificent scene. After waving and yelling back and forth to the canoeists we took their photograph and let them go about their way; they soon “pulled over” to camp right beneath Big Bluff. What a great spot! The light was waning so we decided to hike back up to our camping spot and get our shelters built. I hung my hammock then helped Brian set up his new tent. The amount of rocks at the top of the mountain there greatly harshed Brian’s gig as he tried to drive stakes into the ground. We figured out a way to pull his tent apart using the various large rocks and guy lines and it was able to stand after that. We then set out to build a fire, which proved extremely difficult considering the amount of wet tender that we found; the area had received quite a bit of rain the night before. We eventually, after an hour or so, got a nice huge fire going. We sat around and had a few drinks while we waited until well after dark to finally get some sleep. Around 10:30 or so we heard a couple of voices coming down the trail and noticed a few lights. We thought to ourselves, who would be crazy enough to hike this 3 mile trail in the middle of the night? I shouted a hearty hello but nobody returned the gesture. The lights went out and we both wondered what was going on. After a short pause the lights came back on and the voices behind the lights shouted hello back to us. Ok…? I thought. Let’s find out who these people are! I walked towards the light expecting a couple of guys with packs, guys perhaps just as crazy as me and Brian. To my surprise as I got closer to them and they got closer to me, I noticed there was not one, not two, but 10+ guys with flashlights! The heck? I asked them, what the heck are you doing hiking out here in the middle of the night?! They returned with: “What the heck are you DOING out here in the middle of the night?” I said camping. They said hiking. Touché. The funny thing is, just earlier I had told Brian, no matter where I’m at or what I’m doing something strange happens to me on every single adventure that I go on. I guess that’s why they call them adventures? In any case, the guys were there and we had a strong fire burning. The night was cold, definitely below 40, so they figured they’d stick around for a while and use our campfire to get warm. They told a few stories and we all shared a few laughs before they decided it was time to hike back out at 11:30 at night. Shortly thereafter Brian and I decided it was about time to hit the hay, it had been a long day of adventure, after all. I told my story, let’s hear yours in the comments below!